Gregory Photopoulos and Catherine Gunn, Interim Director, Health Sciences, at the ECR in Vienna, Austria. The 25th annual European Congress of Radiologists (ECR) recently wrapped up in Vienna, Austria. The 5-day event took place between February 27-March 3, and was attended by over 30,000 delegates. 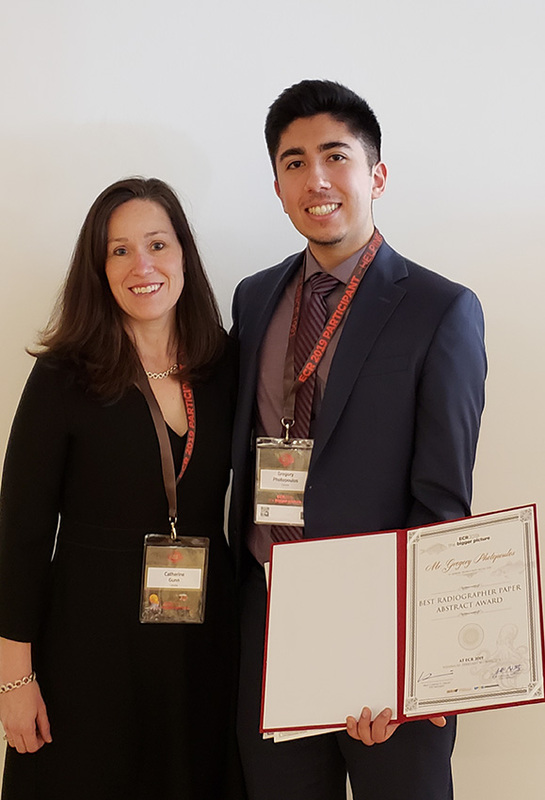 Among those in attendance was third-year Health Sciences (Radiological Technology) student Gregory Photopoulos, whose group paper, “Impact of a CT scan simulator on student learning”, was the winner of one of the Best Radiographer Abstract Awards. The ECR is one of the largest medical meetings in Europe and the second-largest radiological meeting in the world. The ECR attendees span all areas of the radiology arena including: radiology professionals, radiographers, physicists, industry representatives, and members of the medical and general media professions. This was Photopoulos’ first research project through the European radiography research school known as OPTIMAX. Photopoulos was part of a research group with five other radiography students and two professors from across Europe. They spent three intensive weeks conducting research at the school in Dublin, Ireland, during the summer of 2018. “It was an extraordinary experience overall, and I thank my professor, Catherine Gunn, for helping arrange this great opportunity,” says Photopoulos. The Faculty of Health also provided support for him to attend the ECR. Photopoulos hopes to continue being involved in research abroad and at Dalhousie, where he is currently completing the 3rd year of his BHSc in radiological technology. Additionally, he is interested in applying for a specialty practice in research for the remainder of his degree. He also would love to attend the ECR again in 2020.